The Wyndham New Yorker Hotel is a historic hotel located at 481 Eighth Avenue in New York City, United States. The 43-story Art Deco hotel, opened 1930, is a 1,083-room, mid-priced hotel located in Manhattan's Garment District and Hell's Kitchen areas, near Pennsylvania Station, Madison Square Garden, Times Square, and the Empire State Building. The 1-million-square-foot (93,000-square-meter) building offers two restaurants and approximately 33,000 square feet (3,100 m2) of conference space. Due to its noticeable marquee and proximity to the Empire State Building, the hotel makes appearances in many films and is the backdrop for TV-studio reports and interviews broadcast worldwide from New York by BBC News. This iconic hotel's varied history begins with its original glamor with fashionable entertainment and famous guests, continues through its decline and subsequent new life as the Unification Church's "World Mission Center," to major capital improvements and reopening in the twenty-first century as a quality hotel and conference center. The New Yorker Hotel was built by Garment Center developer Mack Kanner. When the project was announced in 1928, the Sugarman and Berger designed building was planned to be 38 stories, at an estimated cost of $8 million. However, when it was completed in 1929, the building had grown to 43 stories, at a final cost of $22.5 million and contained 2,500 rooms, making it the city's largest for many years. Hotel management pioneer Ralph Hitz was selected as its first manager, eventually becoming president of the National Hotel Management Company. An early ad for the building boasted that the hotel's "bell boys were 'as snappy-looking as West Pointers'" and "that it had a radio in every room with a choice of four stations." It was a New Yorker bellboy, Johnny Roventini, who served as tobacco company Philip Morris' pitchman for twenty years, making famous their "Call for Philip Morris" advertising campaign. The hotel opened on January 2, 1930. Much like its contemporaries, the Empire State Building (1931) and the Chrysler Building (1930), the New Yorker was designed in the Art Deco style which was popular in the 1920s and 1930s. In his book New York 1930 Robert A. M. Stern said the "New Yorker's virtually unornamented facades consisted of alternating vertical bands of warm gray brick and windows, yielding an impression of boldly modeled masses. This was furthered by the deep-cut light courts, which produced a powerful play of light and shade that was enhanced by dramatic lighting at night." In addition to the ballrooms there were ten private dining "salons" and five restaurants employing 35 master cooks. The barber shop was one of the largest in the world with 42 chairs and 20 manicurists. There were 95 switchboard operators and 150 laundry staff washing as many as 350,000 pieces daily. The New Yorker guests had direct access to Penn Station by means of the hotel’s private tunnel. In 1939, NBC began broadcasting live from The Terrace Room which became known for big band acts, as well as nightly ice-skating shows on the hotel’s retractable ice-skating rink. Throughout the 1940s and 1950s, the hotel was among New York's most fashionable. In the building's heyday, it hosted many popular Big Bands, such as Benny Goodman and Tommy Dorsey, while notable figures such as Spencer Tracy, Joan Crawford, and Fidel Castro stayed there. 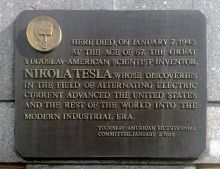 Inventor Nikola Tesla spent the last ten years of his life in near-seclusion in Suite 3327, where he died, largely devoting his time to feeding pigeons while occasionally meeting dignitaries. In later years, Muhammad Ali would recuperate there after his March 1971 fight against Joe Frazier at Madison Square Garden. By the time Hilton reacquired the hotel, the pronounced decline in New York's fortunes, coupled with the construction of new, more modern hotels, caused the New Yorker to become unprofitable. As a result, Hilton closed the hotel in April 1972. Initially left vacant, several proposals were made for the building, including redevelopment as a low-income housing development, and a hospital. Ultimately, in 1975, it was purchased by the Unification Church of the United States for $5.6 million. The church converted much of the building for use by its members. The hotel housed offices of many church departments and was known as the "World Mission Center" for several years. Church holy day celebrations were held there, with Sun Myung Moon often speaking to members in the Grand Ballroom. He also held "matchings" there, the first step in arranged marriages where he would suggest marriage partners to members who had gathered to be introduced to their future spouse. A notable example took place in 1982 when, following a matching ceremony, the newly engaged couples, joined by others who had been engaged two or three years previously, gathered in the New Yorker Hotel and walked across to Madison Square Garden to participate in the 2075 couples marriage Blessing Ceremony. 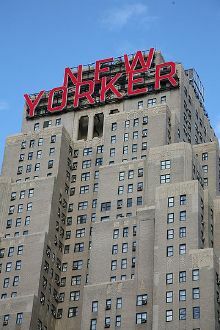 In 1994, the Unification Church elected to convert a portion of the building to use as a hotel again and the New Yorker Hotel Management Company took over operation of the building. It began the largest renovation project in the New Yorker's nearly 65-year history, completed in 1999, with $20 million in capital improvements. In 1997, the Tick Tock Diner opened in the space on the corner of 34th Street and 8th Avenue. With 280 seats, it claims to be the largest diner in New York City and serves meals around the clock. The hotel joined the Ramada chain in 2000. In August 2007, the hotel began a second capital improvement program, which was completed in February 2009 at a final cost of $70 million. These improvements increased the number of guest rooms available from 178 in 1994 to 912, located on floors 19 through 40. The renovation project was designed by Stonehill & Taylor Architects. Interior improvements included room restructuring and augmentation (now called "Metro" and "City View" rooms). Other improvements included a refurbished front entrance, lobby redesign, foyer reconstruction, and ballroom renovations. The hotel also expanded its Wi-Fi and PDA support, and added high-definition flat-screen televisions in all rooms. In addition, individual room air-conditioning units were replaced with modern centralized heating and cooling systems throughout the entire hotel. In 2009, conference room space was added to the hotel through the conversion of a defunct Manufacturer's Hanover Bank branch in the hotel, bringing the total meeting space to just over 33,000 square feet (3,100 m²), in two ballrooms and twelve conference rooms. In 2016, Hillary Rodham Clinton gave her presidential election concession speech from the New Yorker Hotel's Grand Ballroom. ↑ R.W. Sexton, American Apartment Houses, Hotels, and Apartment Hotels of Today (New York, NY: Architectural Book Publishing Company, Inc., 1929), 184–185. ↑ 2.0 2.1 2.2 2.3 The New Yorker History. Retrieved August 6, 2017. ↑ 3.0 3.1 Bill Harris and Jorg Brockmann, One Thousand New York Buildings (Black Dog & Leventhal, 2002, ISBN 978-1579122379), 257. ↑ Michael T. Kaufman, Joseph F. Cullman 3rd, Who Made Philip Morris a Tobacco Power, Dies at 92 The New York Times, May 1, 2004. Retrieved August 6, 2017. ↑ 5.0 5.1 5.2 5.3 5.4 5.5 Kim Velsey, Long Famous But Not Quite Fabulous: The New Yorker Hotel New York Observer, November 20, 2014. Retrieved August 6, 2017. ↑ Tom Blalock, "Powering the New Yorker: A Hotel's Unique Direct Current System," IEEE Power and Energy Magazine, 4(1) (2006):70-76. ↑ Milestones:Largest Private (dc) Generating Plant in the U.S.A., 1929. Retrieved August 8, 2017. ↑ Robert A.M. Stern, Gregory F. Gilmartin, and Thomas Mellins, New York 1930: Architecture and Urbanism Between the Two World Wars (Rizzoli, 2009, ISBN 978-0847830961). ↑ 9.0 9.1 Werner Bamberger, New Yorker Hotel, Sold to Become a Hospital, Closes Doors After 42 Years The New York Times, April 20, 1972. Retrieved August 6, 2017. ↑ Hilton Chain Acquiring New Yorker Hotel Here The New York Times, November 26, 1953. Retrieved August 6, 2017. ↑ New Yorker Hotel Is Sold by Hilton Group To Massaglia, Owner of chain of 11 Units The New York Times, May 15, 1956. Retrieved August 6, 2017. ↑ Joseph Fried, New Yorker Hotel Repurchased by Hilton Chain; Purchase Subject to Debts The New York Times, December 9, 1967. Retrieved August 6, 2017. ↑ John T. Biermans, The Odyssey of New Religious Movements, Persecution, Struggle, Legitimation: A Case Study of the Unification Church (Edwin Mellen Press, 1987, ISBN 978-0889467101). ↑ Mervyn Rothstein, Commercial Real Estate; Making New Yorker Hotel New Again The New York Times, January 6, 1999. Retrieved August 8, 2017. ↑ Tick Tock Diner. Retrieved August 5, 2017. ↑ 16.0 16.1 Richard L. Johnson, The 912 room New Yorker Hotel Completes Massive 18-month, $70 million Renovation Hotel Online, February 25, 2009. Retrieved August 8, 2017. ↑ Iconic New Yorker Hotel Joins Wyndham Brand Hotel News Resource, March 3, 2014. Retrieved August 8, 2017. Sexton, R.W. American Apartment Houses, Hotels, and Apartment Hotels of Today. 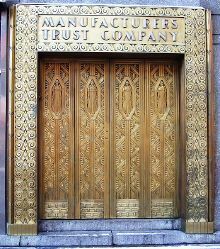 New York, NY: Architectural Book Publishing Company, Inc., 1929. History of "New Yorker Hotel"
This page was last modified on 21 November 2018, at 17:01.